I received this skein of Aslan Rends Royal Alpaca yarn through a Ravelry swap I participated in. I have been holding on to it for a quite a while, as it is one of the few luxury yarns I have right now. I guess you could say I was saving it for a rainy day. Well, I started using it yesterday, but it’s raining today. Close enough. This is gorgeous yarn! Alpaca is by far my favorite fiber to work with. And this blue is just yummy, and is one of my favorite colors. Whoever was my swap partner at the time sure got my preferences right. I started a lacy scarf with it. I have quite a bit done of it, and there’s a lot of yarn left. I guess I’m about half done. I’ll show photos of the scarf once it’s done and blocked. Oh, and as for the recipient of the scarf….it’s me. My favorite fiber and one of my favorite colors? Of course, I’m keeping it! 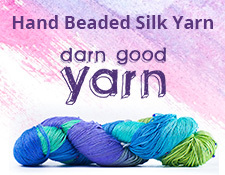 See the photos below for dye lot and other info about the yarn. I also have a stash page on Ravelry about this particular skein.